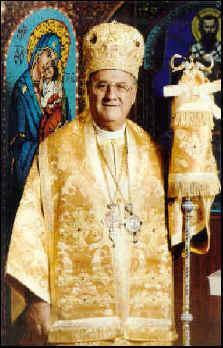 His Eminence the Most Reverend Philip (Saliba), Archbishop of New York and Metropolitan of All North America (June 10, 1931 – March 19, 2014), was the primate of the Antiochian Orthodox Christian Archdiocese of North America (1966 to 2014). 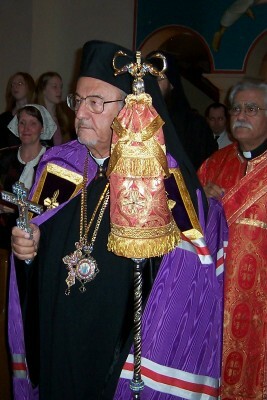 He was the longest serving Orthodox bishop in American history. He was also one of two Vice Chairmen of the Episcopal Assembly of North and Central America. Philip was born Abdullah Saliba in the small village of Abou Mizan in Lebanon. In 1945, at the age of 14, he went to seminary at the Balamand Orthodox Theological Seminary in Tripoli, Lebanon, where he met his lifelong friend, known today as His Grace, Bishop Antoun (Khouri) of Miami. He finished his schooling there in 1947, going to to further his studies at the Orthodox Secondary School in Homs, Syria (1947-1949). He was ordained a deacon on August 6, 1949, and appointed Secretary (1949-1953) to Patriarch Alexander III of Antioch, while continuing his studies at Assiyah College, Damascus, Syria (1949-1951). During his service as Patriarchal Secretary, he returned to Balamand Seminary and served as Dean of Students and Lecturer in Arabic Language and Literature (1952), eventually going to England and and pursuing further studies at Kelham Theological School, Nottinghamshire, UK (1953) and the University of London (1953). Dcn. Philip then came to the country where he would embark upon his life's work—the United States. At first, he continued his theological studies at Holy Cross Greek Orthodox School of Theology, Brookline, Massachusetts (1956), but left in 1956 to earn a B.A. in History at Wayne State University, Detroit, Michigan (1956-1959), serving at nearby St. George Church (also in Detroit) as a deacon. In 1959, he was ordained to the holy priesthood on March 1 by Metropolitan Anthony (Bashir) of New York and appointed to pastor St. George Church in Cleveland, Ohio, where he served from 1959 to 1964. He then went on to complete his theological education at St. Vladimir's Orthodox Theological Seminary in Crestwood, New York, earning the M.Div. degree in 1965. In 1966, while still a priest and only 35 years of age, he was elected to serve as primate of the North American archdiocese of the Church of Antioch. In June of that year, he was elevated to the rank of archimandrite by Metropolitan Elias (Kurban) of Tripoli. On August 14, 1966, he was consecrated to the sacred episcopacy and made an archbishop at St. Elias Monastery in Lebanon, performed by Patriarch Theodosius VI of Antioch. His enthronement as Metropolitan of New York was held in New York on October 13 of that year. During his tenure as metropolitan, His Eminence made multiple major achievements for his flock, including the founding of the Antiochian Orthodox Christian Women of North America (1973), the Order of St. Ignatius of Antioch (1975), and the St. Stephen's Course in Orthodox Theology (1980). In 1978, he purchased the land for and founded the Antiochian Village retreat center and summer camp, where the Antiochian House of Studies program (founded 1992) is held. 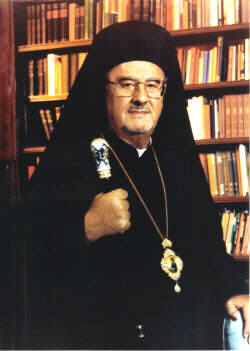 One of his most famous acts was the reception of the majority of the Evangelical Orthodox Church in 1987, renaming them the Antiochian Evangelical Orthodox Mission. In 1975, Metropolitan Philip led the healing of the division between the two Antiochian archdioceses in America. With Metropolitan Michael (Shaheen) of Toledo, he combined the Archdioceses of New York and Toledo into a single archdiocese, becoming its primate while Archbishop Michael retired as an auxiliary archbishop. For more than 40 years, Metropolitan Philip led the Antiochian Orthodox Christian Archdiocese of North America, more than tripling the size of the archdiocese from about 65 parishes to around 250 parishes and missions today. He also served as the Vice Chairman of SCOBA. This page was last edited on May 19, 2014, at 22:47.